Rajasthan BSTC Result 2018: University of Govind Guru (UoGGTU) is announced the BSTC Result 2018 on june 6th. 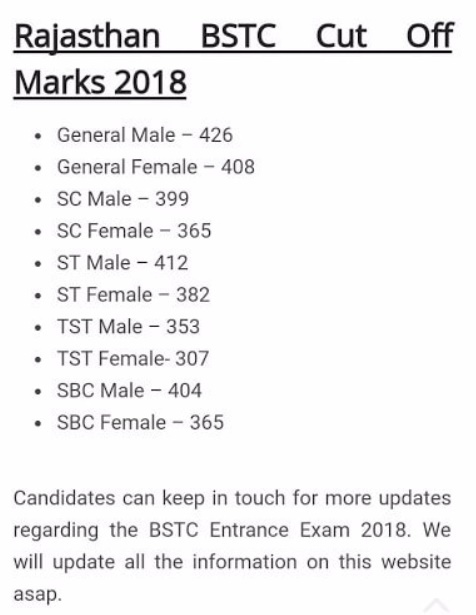 All the aspirants those have given the examination 6th May can now check the BSTC result, rank, and score from BSTC official website bstcggtu2018.com. Students can Download GGTU University BSTC Exam Cutoff Marks, Score Name wise Results From Official websites below. The BSTC results 2018 unveiled by the Minister of State for Primary and Secondary Education in the government of Rajasthan at Education complex in Jaipur yesterday on june 6th. The ETV Rajasthan channel has telecasted this news regarding the BSTC result. Students hoping for the results can now check their result. Check more details of Rajasthan BSTC Result 2018 from this article. The University of GGTU, Rajasthan conducted the Basic School Teaching Course (BSTC) examination on 6th May in 1273 examination centers across the state of Rajasthan. This is the entrance examination conducted yearly once to affirm the admission into Diploma in Elementary Education (D.El.Ed.) program based on the rank acquired by the candidates. Annually a great many numbers of candidates are going to compete for BSTC admission test. This year 5 lakh above aspirants were enrolled for the examination and 90% applicants have given the test. As per reports, 4,78,818 candidates have attempted BSTC Examination this year. There is a tough competition for BSTC Examination this year. All the students those have done with the examination are very eager to check their results. Now the wait is over. The UoK is coming up with BSTC Result, rank, score and cutoff marks. Candidates can check their rank and score as well. Students scoring the qualifying marks in the examination are said to be qualified in the examination and the chances will be there to get admission into D.EI.Ed course. The University of GGTU is soon going to announce the counseling dates information for students. As per reports, we came to know that the GGTU Announced the counseling and document verification dates Hence candidates must be patient until the GGTU announces the dates; students can keep checking the BSTC portals on regular basis for up to date information. Results of Rajasthan BSTC 2018 along with score will appear on your screen; also the cutoff marks and merit list will be displayed on the main page of the website. Download the results and take a print out of it for future reference. sir mene second round me collage choice nahi bhara kya me third list me kar sakta hoo kya?